We needed to time consider our options with the car. Colin had done some research and read that by disconnecting the battery overnight you reset the computer - so we gave this a go. Only time would tell when were back on the road again. We would wait and see if it played up again and then decided to go straight to Darwin or do Litchfield as planned. 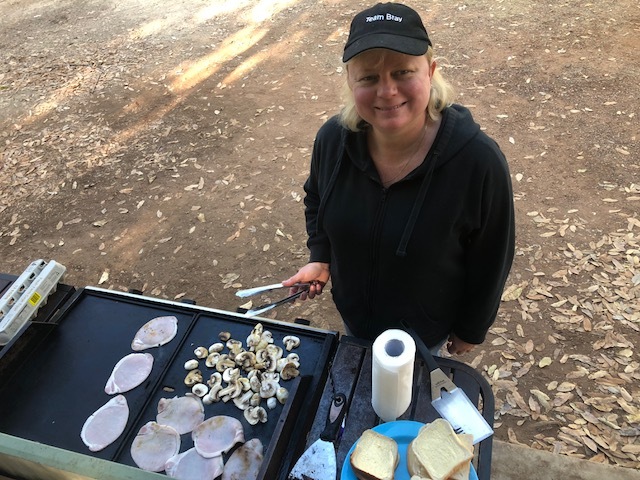 As it was Sunday we just had a rest day and explored Mataranka - starting with a yummy cooked breakfast on the camp kitchen. We then explored Mataranka Springs. We were supposed to be feeding the Barramundi but they didn't show - ended up feeding a turtle.